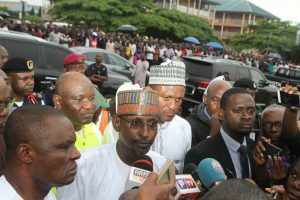 FCT Minister Malam Muhammad Musa Bello was on ground at the site of the Jabi building collapse during which he assured the public of adequate emergency medical care for victims. As at press time only about 6 have been rescued with various degrees of injuries and were rushed to nearby hospitals. The Minister who was accompanied by the FCT Permanent Secretary, Sir Chinyeaka Ohaa, was on sight to oversee rescue operations at the scene of the unfortunate incident and commended emergency officers and fist responders for their prompt response. His word: “Efforts are ongoing to excavate the place and clear to rubbles in order to rescue some of the people suspected to have been covered by the rubbles. The Minister prayed that the rescue operators would meet the victims alive. “We are working to get under the debris to get out all those that have been trapped there. And I am very appreciative of the quick response of the emergency management agency and as you can see, they are doing a good job. The ambulances are here what we need now is to support the rescue workers. Asked what he intends to do against the background of the unconfirmed report that the building had been abandoned for 15 years until now when the owner mobilized to site, Bello responded that for now the focus is on rescuing those trapped. He however indicated that a machinery would be set in motion to unravel the reason for the building collapse. 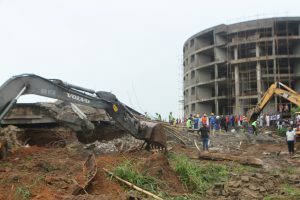 The three storey complex located near Jabi Motor park had collapsed in the afternoon of today a few hours before the heavy downpour that took place. Rescue workers comprising officers and men of the FCT and Federal Emergency management agencies as well as other rescue workers braved the rainfall to carry out the rescue operation. 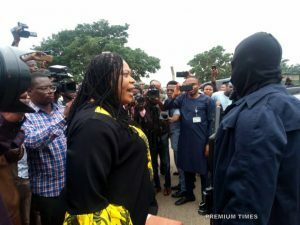 Emergency services were on high gear when the FCT Minister visited the site for an on-the-spot assessment of the level of disaster and to offer the necessary assistance.